Take healthy haircare with you on the road with this compact Travel Set. 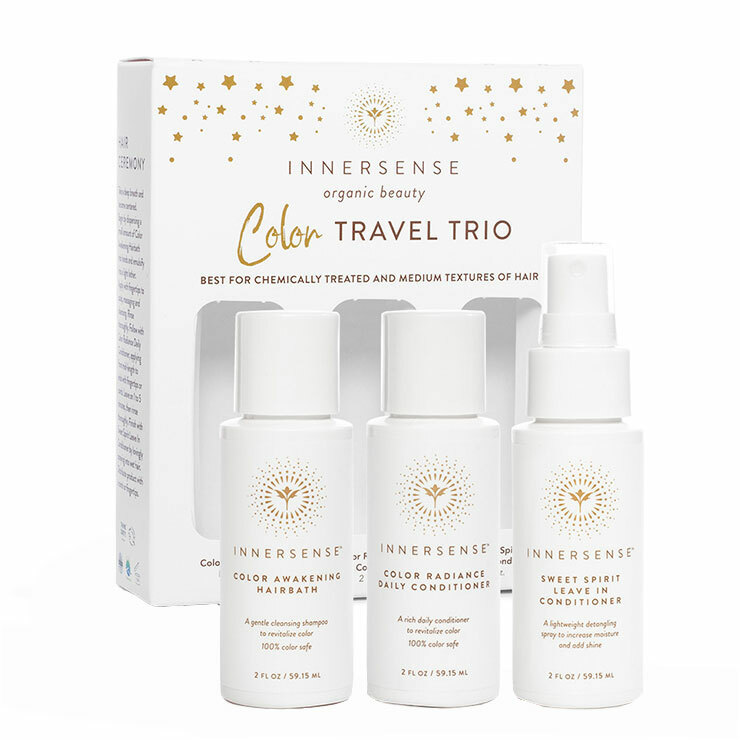 This Innersense trio delivers a look of natural vitality to your hair. Fortified with botanicals, this collection of travel size hair products gives hair a look of body and shine without a feeling of residue or dryness. It's a heroic way to introduce clean hair care as a gift. Pure Harmony Hairbath: Water, Aqua- EAU, Cocamidopropyl Hydroxysultaine1, Sodium Cocoyl Isethionate1, Caprylyl/Capryl Glucoside1, Glycerin, Sodium Chloride9, Sodium Lauroyl Methyl Isethionate1, Butyrospermum Parkii (Shea Butter)4, Citrus Aurantium Dulcis (Orange) Peel Oil5, Citrus Medica Limonum (Lemon) Peel Oil, Eucalyptus Globulus (Eucalyptus)6, Cucurbita Pepo (Pumpkin Seed Oil)*3 ,Hydroxypropyltrimonium Honey7, Hydrolyzed Quinoa, Trisodium Ethylenediamine Disuccinate9, Sodium Benzoate, Hydrolyzed Rice Protein, Guar Hydroxypropyltrimonium Chloride9, Potassium Sorbate, Citric Acid, Citrus Sinensis (Orange) Oil*, Persea Gratissima (Avocado) Oil2, Oryza Sativa (Rice) Bran Oil5, Camellia Sinensis (Green Tea) Leaf Extract8*, Cucumis Sativus (Cucumber) Fruit Extract, Persea Gratissima (Avocado)2* Fruit Extract, Mangifera Indica (Mango)* Fruit Extract. Color Awakening Hairbath: Water, Aqua- EAU, Cocamidopropyl Hydroxysultaine1, Sodium Cocoyl Isethionate1, Caprylyl/Capryl Glucoside1, Glycerin, Sodium Chloride9, Sodium Lauroyl Methyl Isethionate1, Butyrospermum Parkii (Shea Butter)4, Citrus Aurantium Dulcis (Orange) Peel Oil5, Citrus Medica Limonum (Lemon) Peel Oil, Eucalyptus Globulus (Eucalyptus)6, Cucurbita Pepo (Pumpkin Seed Oil)*3 ,Hydroxypropyltrimonium Honey7, Hydrolyzed Quinoa, Trisodium Ethylenediamine Disuccinate9, Sodium Benzoate, Hydrolyzed Rice Protein, Guar Hydroxypropyltrimonium Chloride9, Potassium Sorbate, Citric Acid, Citrus Sinensis (Orange) Oil*, Persea Gratissima (Avocado) Oil2, Oryza Sativa (Rice) Bran Oil5, Camellia Sinensis (Green Tea) Leaf Extract8*, Cucumis Sativus (Cucumber) Fruit Extract, Persea Gratissima (Avocado)2* Fruit Extract, Mangifera Indica (Mango)* Fruit Extract.